Dandelion Jelly? YES! It’s a lovely bright yellow with a somewhat-like-honey taste (only lighter) and a bit of an ‘earthy’ undertone. The color itself is enough to try this. And the satisfaction you get from foraging in the yard to make a canned good? Well, that’s pretty priceless! I’ve always been a sucker for dandelions (even before they became ‘popular’). I know most people outgrow their soft-hearted affection for the little yellow ‘weed’ but I haven’t. Dandelions just make me happy. 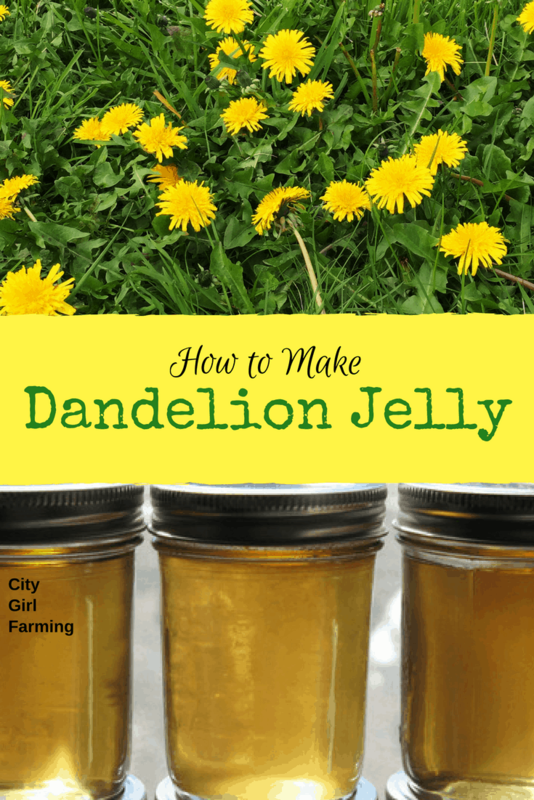 This recipe for Dandelion Jelly is a good one and definitely worth a try. This jelly recipe requires a bit of pre-jelly-making prep. You’ll need to gather dandelions and separate the petals from the rest of the flower and then make those petals into a ‘tea’ that will be used in the jelly. This tea needs to seep overnight. None of these steps are hard, but it requires a bit of extra planning. 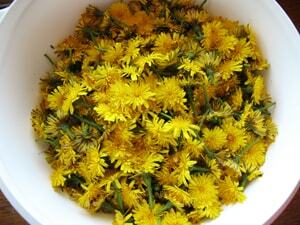 First, you need to collect some dandelions (just the yellow flower head). Your end goal is to have 4 cups of JUST the yellow petals. To get that, you need A LOT of flowers (aim for 3-4 times more cups of whole flowers than your end goal of petals). Go early. Dandelions tend to fold up and close down shop later in the day. You want them with petals fully exposed for easier harvesting. Collecting THAT many dandelions covers your hands with sticky pollen. It’s good to bring a wet washcloth with you to clean up after it’s all over. Choose dandelions that are growing AWAY from heavily trafficked areas. You don’t want to eat all that car exhaust gunk! Also, make sure the places you’re collecting haven’t been sprayed with chemicals! Next, you need to separate the petals from the rest of the flower. You’re after JUST the yellow petals. Nothing else. I’ve read a lot of information out there about how to do this by basically snipping off the flowers at the base of the green bulb, ad then picking out a ton of green leaves (because they are bitter)….but I’ve figured out a better, easier way that virtually leaves no green behind to pick out later (therefore saving a ton of time). Basically, I take my two thumbs and put them on the green base of the dandelion and pull it apart (see below). With the base pulled into two, you can basically lay it flat. Then, I pick out all the yellow petals. It’s that easy. No scissors, no digging out little green bits! From that huge collection of dandelions, you should collect 4 cups of petals. Once your petals are measured, put them in a big bowl and pour boiling water over them. This will create a dandelion ‘tea’ that will be used in the jelly making. Let this tea seep overnight. In the morning, strain the petals through a cheese cloth or a coffee filter (I used wet paper towels). 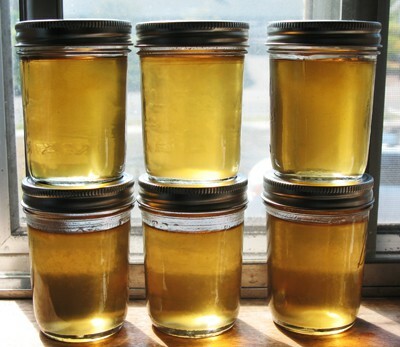 Now you have dandelion tea and you’re ready to make jelly. After your tea is done, we’re finally ready to make jelly. Add 3 cups of tea to a saucepan. If you don’t have enough tea, add water to make 3 cups. 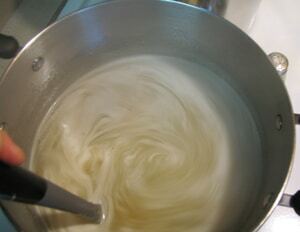 Stir in 4.5 cups of sugar and 1 box of pectin. Bring mixture to a boil and boil for 2 minutes. Ladle into hot, prepared jars and process for 10 minutes (or more, depending on altitude). See Canning section for more information. I took a little taste of the mixture before I boiled it, and, I have to admit, it wasn’t too tasty. Kind of weedy. It was also pretty dark. 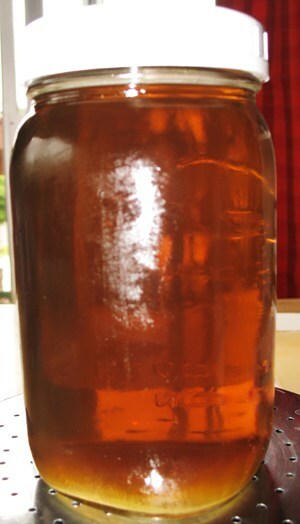 It looked more like a typical iced tea with the brown-ish color than it did of bright sunny colored jelly (darker than pictures I’ve seen of the finished product)…but it lightened in color as it cooked. The recipe I used said that it would make four 1/2 pint jars, but I found it made 6-7 1/2 pint jars (I made 2 batches). The first batch foamed a LOT while I was boiling it, so I decided to use 1/2 teaspoon butter in the second batch to reduce the foaming…however, that batch didn’t set up as well, so I wouldn’t do that again. The final results of the dandelion jelly were great. It’s a light, soft set jelly with a sweet, honey-like taste. Everyone that’s tasted it has been surprised that they liked it. Yes, the pre-prep work is a bit tedious, but the results are wonderful…and it gives you a great, unique gift to share with others! The finished product…sunshine in a jar! Want to eat more dandelions? Try these: Dandelion Pesto and Dandelion Rhubarb Pie. Mmmm good. 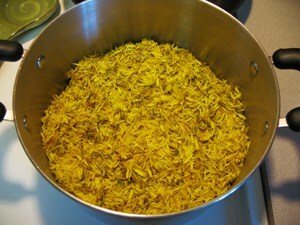 Also, make some Dandelion Salve for your aches and pains!